The best part about my Hidden Gems binder is I can put in any card I want. It's subjective only to me, so when all is said and done, I really don't have to explain myself in great details why a particular card got a slot in a binder page. 1989 Score. Who really knows the production run of the set, but we can easily assume it was huge. 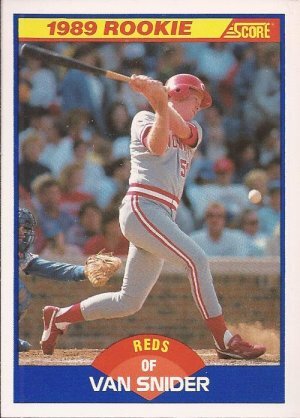 Van Snider got a total of 19 games in the big leagues over two years with the Reds. He has 35 at bat with 7 hits and one home run. Stuck out more then half the times at the plate (18 times). Then he was sent to the Yankees and never saw the bigs again. But look at this card. Every bit of Van is on the card, from the tops of his toes to the end of the bat. The badging fits perfectly in the space between his legs as he swings. The kick up of dust from what I thought was his front foot, but after further look, I think he beat the ball into the ground on his swing. Otherwise, he is WAY in front of the pitch. Gorgeous perfection in the time of junk wax. A total nobody in the history of baseball, appearing in my collection on an ugly, overproduced set. Why? I don't know. Just because. The Replacements put out straight garage rock for years, and Pleased To Meet Me is one of their top albums. From the start with I.O.U into Alex Chilton through to the end with Skyway and Can't Hardly Wait, it's a disc to play straight through every time. I aways contend some of rocks best songs are place at #3 on a disc, and I Don't Know is no exception. Right after the semi-poppy Alex Chilton came this song that spoke a bit of the band leaving it's punk rock roots and going more mainstream. After Alex Chilton, I think it's the best song on the album. BTW - If you want an amazing version of Can't Hardly Wait, listen to this demo version from the album Tim. Now I can finally put a face to the name of the guy who the Reds sent to the Yankees for Hal Morris. Van Snider played 2 games at Wrigley in 1988. Went 0-4 with 3 strikeouts and an RBI groundout. One September 2nd, the catcher was Damon Berryhill when he pinch struckout. On September 4th, the catcher for Snider's portion of the game was Rick Wrona. big mats fan right here. love ptmm, but alex chilton is not a favorite of mine. tim is a great album with a couple of my favorite songs - bastards and left of the dial, but let it be has unsatisfied which always gets turned way up.